The first book in the thrilling YA sequence, Order of Darkness. The year is 1453, and all signs point to it being the end of the world. Accused of heresy and expelled from his monastery, handsome seventeen-year-old, Luca Vero, is recruited by a mysterious stranger to record the end of times across Europe. Commanded by sealed orders, Luca is sent to map the fears of Christendom, and travel to the very frontier of good and evil. Seventeen-year-old Isolde, a Lady Abbess, is trapped in a nunnery to prevent her claiming her rich inheritance. As the nuns in her care are driven mad by strange visions, walking in their sleep, and showing bleeding wounds, Luca is sent to investigate and all the evidence points to Isolde's criminal guilt. Outside in the yard they are building a pyre to burn her for witchcraft. Forced to face the greatest fears of the dark ages - black magic, werewolves, madness - Luca and Isolde embark on a search for truth, their own destinies, and even love as they take the unknown ways to the real historical figure who defends the boundaries of Christendom and holds the secrets of the Order of Darkness. I knew I had to read this book after this review alerted me to Philippa Gregory's foray into YA literature. I'm definitely a fan of her writing, having read a couple of her books, the most impressive, in my opinion, being The Other Boleyn Girl. I am a complete history geek, and had really high hopes, as I'm usually kept transfixed. For the most part, I enjoyed it. I liked the mysteries that seemed difficult to explain, and the sense of injustice felt at Isolde's plight (a very plausible situation, back then) kept me interested throughout the book at what would become of her. It was also good when various characters (and not just Luca) were able to shed some light on the piece of the puzzle - it made it seem a little more realistic. I really liked the character of Freize, and how he reacts around pretty much everyone! However, there was some sort of sparkle missing, especially given my expectations of the author. I couldn't put my finger on what it was this morning, when I finished the book, but I think I've got the gist now. This may be my natural cynicism, but it seemed as though Luca and Isolde were both a little too perfect - they're both great looking and have sexual chemistry, which, given that it's supposed to be staying relatively historically accurate, doesn't seem entirely appropriate, unless in later books they manage to resist each other. Then, there are some moments that are only half-arsedly explained. (SPOILERS!) Firstly, it is suggested that Freize did not, as he said, release them from the dungeon, but no reason is given for this. Then, the werewolf is given as a little boy lost years before. All well and good, but can a wild child really be mistaken for an animal? I must admit, it stretched my imagination a little far! Despite my criticism though, it wasn't a bad book, and I probably would read the other books in the series. 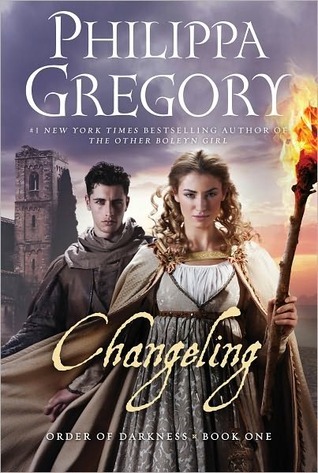 The Changeling aspect was barely touched upon, which is odd considering it's the title of the book! The plot was good, and if the character development gets a little better, I will probably be rating them higher than this one!